I'm loving a good throw back at the moment, especially all things 80's. This outfit was just screaming that very era as loud as you can imagine, what with the high waisted oversized jeans and the classic raglan. 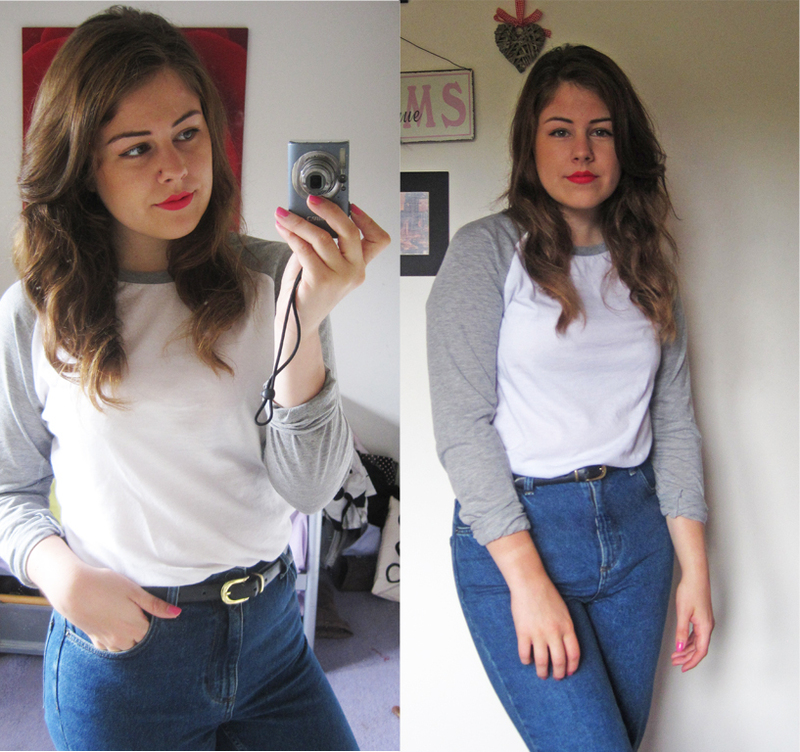 I wore my MOM jeans from Topshop in a dark, vintage blue and then simply tucked in a white and grey raglan from ASOS, which I purchased from the men's section as I wanted that baggy'er fit. Plus.. who says we can't wear men's clothes, eh?! Accessory wise I wore a black belt, which was from Dorothy Perkins at a remarkable £1? I loved this belt as it's so handy and can be a small yet bold statement piece to any outfit. This was a very boy'ish, laid back and timeless look. It's extremely easy to achieve and can be done with t-shirts too as no one can resist a jeans and t-shirt day! For a slightly feminine touch I wore my MAC lipstick in a fuchsia pink, which is the called Amplified as is ridiculously gorgeous to wear. It's not horrific and sticky but instead is unnoticeable and long lasting, plus the colour is just perfect for any casual outfit! It's practically my new red.